Please join us in supporting our sister agency, the Fatherless Foundation. 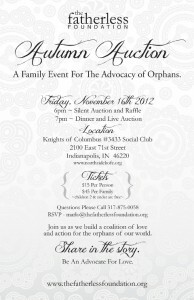 The Fatherless Foundation is holding its annual Auction Benefit on Friday, November 16th at 6pm at The Knights of Columbus on 71st Street in Indianapolis, Indiana. The Fatherless Foundation exists to serve the adopting family, advocate on behalf of the orphan, and respond with action to provide holistic care for orphans and vulnerable children worldwide.